Rookery Waters is hitting top form at the moment with both pleasure anglers and matchmen alike bagging up. It’s no surprise then that the regular Saturday opens at the fishery are now being spread over the two main pools. In last weekend’s encounter it was Steve Freeman taking the honours and earning a place in the big £1,000 grand final to be fished later in the year. He used pellets and meat on the pole in both edges and pellet long tight to the lilies from peg 29 on the Magpie Pool and caught carp to 3lbs to finish with 189lb 14oz. 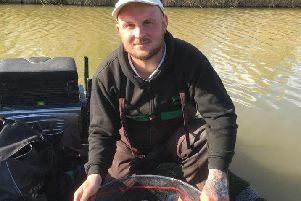 Not too far off the pace was Chris Saunders, who was on peg eight and caught on meat all day for 167lb 2oz. Then came Kevin Peacock with 160lb 10oz. Over on Jay Lake top rod on peg 26 was Simon Skelton with 115lb 4oz followed by Josh Pace with 105lb 9oz and Wayne Shepherd on 83lb 14oz was. In the Thursday £1,000 qualifying open match on Magpie, Pace topped the field with 145lb 12oz using pellet on the deck from favoured peg 27. He caught a big stamp of fish averaging 4-5lb. Second was Kevin Peacock on 107lb 12oz, then came Chris Saunders on 102lb 14oz. There was a very good turnout for the Webb’s AC match at Kingsland Fishery which saw Martin Parker out in front with 103lb 8oz. He alternated between the feeder and pole and caught carp to 15lb. John Crouch came second with 94lb 5oz, followed by Mick Linnell on 82lb 11oz. Float Fish Farm, Wednesday Over 50s: 1 Tony Hudson 110lb 7oz; 2 Roy Wells 82lb 13oz. Float Fish Farm, Bank Holiday Monday, Two Islands: 1 Stan Dow 135lb 4oz; 2 Roy Wells 125lb; 3 Dave Schwinger 111lb 12oz. Haddon Lodge: 1 Martin Harwood 21lb 2oz; 2 Paul Faulkner 19lb 9oz; 3 Tony Moulds 19lb 2oz.